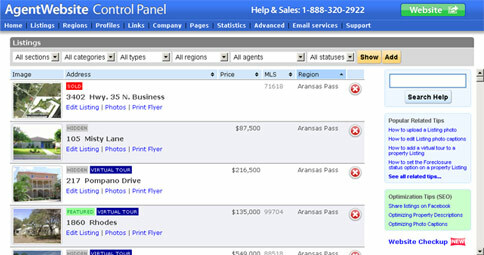 What is the AgentWebsite Control Panel? The AgentWebsite Control Panel is where you go to make changes to your website. Real Help - 24x7 Level One Toll-free help by phone, searchable online help, and video walkthrough to get you started. Need a refresher? Watch it anytime! Property Listings - Sellers will be very happy to hear that you have added their property to the "featured listings" section of your website. It's easy. Price change? No problem. Just go to the AgentWebsite Control Panel and make an instant update. The changes will appear on your website right away. Printable property brochures are automatically created for each property. If you prefer not to enter listings, upgrade to AgentWebsite Premium IDX and have your MLS property listings automatically displayed on your website. Profiles - Whether you are a single Realtor®, a team, or a brokerage of ten agents, credibility is important. You can add and change agent profiles on your website using the AgentWebsite Control Panel. Are you a top producer with three assistants? A husband and wife team? Everyone can have a profile on your website. Links - Buyers typically want information about the local community. Sellers need to find great service providers. You can add links to your website using the Control Panel. Do you have preferred service providers? Add their links to your website. Regions - What neighborhoods or communities do you serve? You can add descriptions and photos of these areas to your website using the Control Panel. Add AgentWebsite IDX and use it to create always up-to-date market pages that show MLS properties by community. Company Information - Use the company section of the Control Panel to update item such as your street address, telephone number, and other important company information. No need to call the "webmaster" when you get a new cell phone number - just go online and make the change instantly. Website Checkup - Make sure your website is professional and search engine friendly with an instant checkup, any time, with the click of a button. Custom Pages - Search engine optimized pages can be added to your website with a single click. Our Microsoft Word style editor makes it easy to create and edit custom pages. Branded Email - POP3, SMTP, IMAP email and webmail branded with your domain name will keep your name in front of prospects and clients. You can add, edit and delete your mailboxes and forwarding addresses online. Our 24x7 Support Team is available by phone to assist with configuring your iPhone, Microsoft Outlook or other email programs if needed. Photo Upload - It's easy to add photos to your website! Photos are automatically resized and sharpened when you upload them. Once uploaded, photos can be rotated with a single click if needed. Up to twenty photos with search engine friendly captions can be uploaded per property listing. You can "drag and drop" property photos to change the order of the photos. Showcase your talent - each team member or agent can have a photo on the website. Need a hand? We can help, just call. Auto-responders - Everyone likes to hear back quickly when they inquire about real estate. Use the Control Panel to create messages that will be automatically sent to everyone who inquires on your website. You can customize unique auto-responders for sales inquiries, rental inquiries, CMA requests, relocation requests and others. Statistics - Monitor traffic on your website with a comprehensive statistics report, updated nightly. "Search Key Phrases" and "Daily Unique Visitor" counts, as well as up-to-date Traffic Building Tips are just some of the useful features in this section of the Control Panel. Support Tickets - Our integrated support ticket system helps keep track of any issues that require the attention of our Support Team. Of course, our 24x7 toll-free telephone line is always available if you prefer to call. Or, you can reply to AgentWebsite Support tickets by email and they will be automatically updated. Options - You can change font colors, font names, font sizes, and many other options to match your personal style. Online Help - Each section of the Control Panel includes an online Help link which includes Frequently Asked Questions and key word search. Browser Compatibility - Your website and Control Panel will work with current versions of today's popular web browsers: Microsoft Internet Explorer, AOL, Mozilla Firefox, Apple Safari and Google Chrome. AgentWebsite Support Team - Our professional and courteous Support Team (We're here in the USA.) is only a toll-free telephone call away, 24 hours a day, including holidays.